That was quite the elision! Risk is ubiquitious in modern finance as an explanation, as Robert Merton says: 'Risk is not an add-on … it permeates the whole body of thought.' Yet it receives only a minor mention that passes so quickly here, as if not to dwell on it long enough to elicit any follow up, such as "which stocks are riskier than than others?" If it's value stocks, why do they have lower betas and volatility than growth stocks? If it's small-cap stocks, in what way are they risky, other than having higher-than-average returns? If it's equities in general, why is the CAPM a failure cross-sectionally? It is, after all, the main focus of his oeuvre, so I think he's unconsciously signalling he's on the defensive here. An interesting point is that the Efficient Markets Hypothesis (which I defend here), is something that started out without much enthusiasm, but over time has grown stronger, led mainly by the obvious fact that it is very difficult to make abnormal returns in the market. Fama gets a lot of flack for it since day 1, but it has been his most enduring idea (clearly, a group effort with Working, Samuelson, and Muth). The risk premium, however, started off as a fait accompli around the same time, though the risk factor is like a Freudian's Oedipal complex, something that started out with supposedly clear empirical support but later was simply assumed. This is because the risk premium is a direct consequence of the most fundamental assumption of economics: a von Neuman-Morgenstern utility function, one that increases in wealth at a decreasing rate. Given that, risk premiums exist, so for most economists, one doesn't need proof. This is nice because we don't have any other than the supposed equity risk premium, which even if it is 3.5% as most experts think, should generalize to something other than the difference in return between equities and bonds (eg, cross sectionally, over time, across futures, currencies, bonds, etc). What if Returns Don't Reach 7%? The return-on-investment targets of 7% to 8% that are structured into pension plans are beyond reach in today's artificial environment. To redeem their promises to retiring teachers, firemen and the like, managers are risking more money with hedge funds in hope of yields higher than those on safer investments. Just five years ago, it was illegal for South Carolina's public pension plan to invest in hedge funds, private equity and other complicated bets. Now, nearly half its assets are in such investments. That is way too much for the state treasurer, who is charged with squeezing the most out of the $26 billion pension fund. The "Global Macro" trading strategy, one of seven tracked by the Dow Jones Credit Suisse "Core Hedge Fund Index," finished last year down over 10%, worse than the entire index, which fell 7.4%. This isn't going to end well. The risk premium of 5% that everyone expects is not going to happen, and this failure will act as positive feedback in the upcoming fiscal disaster; when the pension funds all under perform and need more money, it will be the nail in the coffin. I think the tinder will be inflation, which the central banks seem to think is the cure for their GDP ills (and those of underperforming pensions), so they will push until it comes back. The top line, "AnnReturn", is the arithmetic return, and here the monthly returns for the high beta stocks are about 0.14% higher than the S&P500, which when multiplied by 12 is a 1.7% difference. 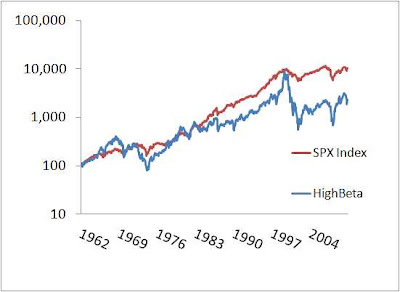 But looking at the chart which shows a total return chart, and the geometric annualized return, we see a very different picture, with the high beta stocks underperforming by 3.5% annually. Thus, the differential annualized variance (in this case, 12% vs. 2%), generates the differential annualized return. Interestingly, the return rankings for these data are different depending on the horizon! Mutual funds and individual investor holding horizons average about 1 year, and I think that's a good assumption for an investment horizon. It seems that 1 year would be the obvious horizon to apply data against, but the problem is there is so little of it. There's like twelve times as much monthly data! A simple fix would be to use log returns, but this doesn't always happen, and I think those who still find the Security Market Line to have a positive slope in general are looking at monthly percent return data, and this is why they see what they do. In the bad old days, insurance was a way to smooth cash flows from improbable but large expenses: fire, health, auto mishaps. Through repetitious metonymy, 'health care insurance' and health care are now synonymous. Emprically, women use more health care, they cost more, estimates are around 35%. Some of this is childbearing, but a lot of it comes from the simple fact they go to the doctor more often (notice women see their gynecologists rather regularly, whereas men have no comparable service). So now charging women more for something they use more of is illegal because it discriminates. Interestingly, in the 1970's there was a law passed so that upon retirement, the annual payments to female retirees had to be the same as for male retirees even though women live longer, statistically. That is, the present value of their retirement packages, by law, are larger for women than men. Government seems to be doing more and more to make it difficult to prevent 'pooling equilibria', cases where different types of applicants get into a pool, eventually pushing out the 'better' or 'lower cost' people who don't want to subsidize the other group. For example, due to legal rulings, it is now very difficult to give job applicants explicit aptitude tests, even though this would be very useful, and avoid the charade from those Microsoft/Google IQ tests given verbally. Interestingly, Nobel Laureate and prominent Big Government advocate Joe Stiglitz's most famous paper relates to an inefficiency from a pooling equilibrium, and his take-away was that markets were inefficient because of this problem. In practice, government encourages pooling equilibrium where it was never a problem before by preventing rational discrimination based on projected costs/benefits based on observable characteristics. While the equilibrium efficiency loss in Stiglitz-Weiss is abstract, it usually creates something pretty simple, as if you can imagine what would happen to insurance if it could not price based on risk and allowed people to opt out: healthy people would leave in droves, which is why Obama-care made insurance mandatory. Think about the lawsuits on disparate impact for mortgage lending in the 1990s, where whites were rejected less often than blacks, and this was presumed discriminatory (in an evil way), and so the only way to make unequal groups equal is to stop making distinctions that differentiate them, which led to simply the idea that down payments and having a job were unnecessary underwriting criteria. It's rather funny that Stiglitz's main theoretical contribution to the academic literature is so starkly in contrast to not just his politics but his obsession, which is increasing the size and scope of government which prioritizes preventing firms from rationally discriminating. Remember that in Stiglitz's model, like everything else in this literature (he didn't invent it), failure to discriminate types somewhat known by participants is what causes all the problems, the 'bad equilibria.' I guess that highlights no one takes these models very seriously--change one assumption here or there, different result. Am I envious, Mr. Romney? You bet I am. But I'm also angry at the stark injustice of it all. In a frank statement posted to his Facebook page on Wednesday, Rubio hinted at a Beltway truth that many other wavering Protect IP and SOPA supporters have been hesitant to admit: More than one lawmaker signed on to the legislation without understanding its technical workings and potential problems, believing it to be an uncontroversial, bipartisan bill that would support American industries. Of course, this highlights that often senators vote for legislation without understanding its technical workings and potential problems. Bloomberg Magazine has a piece on the MIT economists who dominate central banking today. If you ask them why, they will say it's because of their particular blend of theory and practice (as if the idea of theory AND practice is really an outside-the-box idea). I think it's more a matter of this was a group of smart kids who were really interested in macro, because in the 1970's they were still optimistic about its ability to be useful. A small group like that can create a positive feedback loop pretty easily, because having a recommendation from other successful macro economists is very important. If they didn't see our greatest recession since the great depression coming, why should we expect them to see inflation before it's too late? One of the more important facts of life is that adults are often very disingenuous. When the executive VP says 'the United Way chairmanship was the most important job I had here at Amalgamated,' it is a lie; when they imply that their main satisfaction comes from knowing their customers or voters are better off, it is a lie. Sure, there's an element of truth to what they are saying, but emphasis is important too. So, lying is part of life, especially in regard to hierarchies, because any hierarchy needs some platitudes about the greater good to maintain their legitimacy. Anyway, I was in Las Vegas last weekend and hung out with a Black Jack pro. His basic strategy was to find 2 deck black jack tables, which would give him enough time to count cards and generate an advantage. If they reshuffled too early, say after 52 cards, he couldn't make money, and this was part discretionary, part casino rule. I won't give away all his secrets, but the bottom line is that it didn't seem worth it to me. As a job, not an avocation, it didn't seem fun, or even really well paying. The basic card counting part of the job is pretty mechanical and after repetition rather easy. Most importantly, he had a very interesting time with the dealers. Basically, you want them to know and like you, but just a little. Too much, and they will catch on to your game, too little and they won't do you any favors. As they have a lot of discretion, and you are hoping to make say $300 off any on dealer, which in the context of their weekend is not a lot. Thus, they might choose to deal to you with only 25 cards left in the shoe, if they like you, whereas if they don't like you they will reshuffle after 50 cards. A great salesman is one who can make customers like them so much they don't mind paying a little extra, and don't like to even think about what is happening (like when dupes don't care their partner is using them because they are so adorable). Smarts are necessary to make this happen, but to make it a really valuable strategy you need the ability to make the opportunity cost seem a lot smaller than it is. Tucker Max is a populizer of The Neg, a technique whereby men strategically criticize women they're attempting to pickup. The idea is that by doing so you signal deep confidence from your high status, which makes you look more attractive, or at least makes a woman rethink blowing you off. It is intriguing, and I wrote about how Asian guys are picking this up to counteract their more restrained demeanor. Interestingly, I read an interview with Tucker Max over at Psychology Today, and he specifically mentioned several influences that I also quite like to read: Geoffrey Miller (author of Spent), and Robin Hanson (blogs at Overcoming Bias), and the interviewer mentioned Robert Kurzban (author of Why Everyone Else is a Hypocrite). I guess there's a confluence of ideas here that appeals to those with all sorts of angles. But as to The Neg itself, it seems there's a potential refinement that may take your game to the next level. It's called, 'the pratfall', and involves making a clumsy blunder after establishing your awesomeness. For example, after slyly dissing your target of affection by noting her lipstick is smeared, you sink the hook by secretly shaking up a can of soda and then have it 'accidentally' blast you in the face in front of her. Oh my! I'm so clumsy! Here's Yale psychologist Peter Salovey on how it works (info needs only first 5 from where this starts). This is within a Yale Intro Psychology Lecture on Love. Justice says that out of 4.4 million loans approved between 2004 and 2008, 525,000 went to African-American or Hispanic borrowers, of which some 210,000 paid higher fees or rates than the average paid by similarly situated "non-Hispanic White Borrowers." It goes without saying large numbers of white borrowers also paid higher than the average of all whites. It also goes without saying large numbers of minorities didn't pay higher rates, though Justice isn't interested in the average of what minorities paid, only that some minorities paid higher than the average of whites. If this sounds like statistical malpractice, it's apparently habitual. In a rare instance where defendants fought back, two Los Angeles car dealers recently won dismissal of a complaint accusing them of favoring Asian over Hispanic car buyers because 600 of 1,300 "non-Asian" buyers were charged higher loan terms than the average of Asian buyers. Notice that 600 is about half of 1,300. As the dealers noted, Justice's claim amounts to an assertion "half of one group is above average, which means that the other half is below average." Anna Dornhaus gave an interesting lecture on evolutionary biology. I really like this thread ever since I read The Selfish Gene but am finding the stories repetitive, so these were all fresh. Here's some of her stories. Warblers are very good at detecting which of their eggs are cuckoo eggs, something that is not detectable from a casual glance. 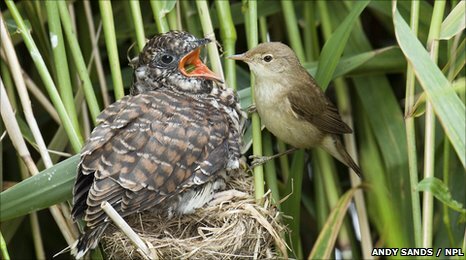 Cuckoos know they have to at least remove one of the Warbler eggs before adding their own, so the competition is clearly into overdrive. Yet, occasionally the Warblers are fooled into letting the Cuckoo egg stay, and once hatched the Warbler raises the behemoth Cuckoo even though it looks nothing like its siblings (3 times the size, different color). It seems conscious minds can only afford to be so discriminating in certain areas, the rest apply simple rules. Minds aren't good at detecting things that never happen in nature. Omnivores like rats are good at figuring out what foods are not good for them, using the simple rule that if they get sick, anything they ate 2 hours ago is no longer considered tasty. Vampire bats only drink blood, and as blood is basically never poisonous, if you do poison the blood to make the bats sick, they will never associate it with the blood from that source. They can't make the connection because from an evolutionary perspective, it basically doesn't happen. Different species of sticklebacks live in the bottom and top of lakes. The top-dwelling sticklebacks can't learn landmarks. It appears the bottom dwelling fish are very good at detecting landmarks, while the top-dwelling fish looks more at how things behave. So perhaps skills not useful in their evolutionary past are eventually lost. On the other hand, female birds are not very good at remembering where they stored food when they have mated because they rely on their mate. Unmated females, however, are just as good as the males at remembering seed caches. I imagine one could therefore argue top-dwelling sticklebacks failed their spatial geometry quiz because it had no value to them. Some animals grow the brain during the part of he year they need it more, and then lose that in the part when they are less cognitively demanding part of the year. More evidence for the use it or lose it principle. Interestingly, scientists bred fruit flies for intelligence. They made bananas taste bitter, which fruit flies don't like. They then gave the flies little markers, so the 'smart' ones would avoid the bitter bananas based on this learned signal, the dumb ones would not. After only 20 generations they generated 'smart' and 'dumb' fruit flies who could learn at different success rates. Then, they mixed them together and saw what happened: Idiocracy, the dumb flies out-reproduced the smart ones! Her take-away was intelligence is costly, and everything has trade-offs. I especially like the idea that any ability comes with trade-offs and so in a sense we are all idiot-savants, good at some things, bad at others, especially with respect to really different people. I know a lot of smart people, but I've never met one who didn't have blind spots. It's good to remember that because if you think that because you have a really high IQ, are really rich, or are a good speaker, you are therefore the smartest guy in any room, you are going to make a very big mistake someday. The government purchases $100 billion of goods, issues $100 billion of bonds, and raises taxes by $3 billion a year in order to amortize the bonds. Government purchases go up by $100 billion this year. Private consumption goes down by $3 billion this year. Net fiscal impetus is not $0 but rather $97 billion. Cochrane doesn't understand the Ricardian Equivalence argument he is trying to make. Now, ignore the Ricardian Equivalence, but just note that Keynesians think $97B was created via this spending and taxes this year, which is why they love government spending regardless of what it is spent upon. But if they issued $100B in bonds to create this 'new demand', where would that $100B have have gone otherwise? I don't think this makes sense in general equilibrium; money is never 'idle' unless it is under your mattress. I guess if you could caricature the two views: one thinks supply creates its own demand, the other that demand creates its own supply. Banks are highly regulated institutions, in spite of what Amar Bhide implies in today's NYT editorial. He argues the Fed should insure all bank deposits, no matter how large, but in response regulate more. The regulators are already regulating a lot, choking off credit. When no specifics are offered, it highlights how clueless such solutions are, as with the current CFPB, which doesn't do anything I'm aware of, but create a new permanent bureaucracy. After all, more regulatory pressure pre-2007 would have just meant more ninja loans, not less, given the conventional wisdom back then. A friend shares with me the following anecdote. He thinks real estate is cheap, and wants to buy houses, and make money renting them. Ultimately, he would sell out of the homes when they recover in value. He has been doing it for a couple years with good results. He went to a bank, to see if he could leverage this idea, say by getting loans for 50% of the purchase price. They said, only if you hold this in a 'compensating balance.' These are cash balances held by the borrower at the bank, and add fees and some safety to the bank. In this case, the bank wants the borrower to keep the entire balance as a cushion, borrow money for a potential liquidity event, that would be rather futile because once the borrower used said compensating balances to rectify a funding problem, it would then have a liquidity problem with the bank. So, in practice, the compensating balance would not be a cushion for tough times, nor would it earn interest for the borrower. My friend decided not to get the loan. The regulators aren't letting bankers return to business as usual, as previously they got 100% loan-to-value, now can't even get 50%! Many still think the bankers basically are parasitic thieves. I maintain that without a healthy bank sector free from the fear of extinction, our recovery will remain weak. Not the macroeconomy, just the science. Not that it every really was a science, just that 40 years ago everyone thought it was, now, not so much. Yesterday I read a really fun catfight between Krugman and everyone (e.g, Tabarrok, then Krugman, then Cowen, then Krugman, but this is typical). Now, losing one's temper in an argument is usually symptomatic of losing the argument, and so I am quite pleased watching Krugman boil over. Yesterday's Krugman post was precious, as he defending being peevish by noting that he only treats people like 'mendacious idiots' if they are so, and civility is irrelevant when the stakes are important! He doesn't understand that civility is more important the greater the stakes, because they are helpful and takes discipline. It's easy to lose it and just start calling someone names, questioning their motives, but this is just appealing to your base emotions, as highlighted by the behavior people with their frontal lobe activity reduced (i.e., drunk people). On the other hand, on issues that are not important, well, it's easy to be gracious about things that don't matter because it takes no effort, there's nothing to restrain, there's no cost of doing so because you don't care if you 'lose'. If you are trying to bring a crowd to your point of view, manners are very helpful, they are a better sign of good faith argumentation. If you are just being angry, this can help incite a predisposed mob, but little else because everyone knows that someone highly emotional is not reasoning at all, just rationalizing. Sure, we all do it, but if we don't at least pretend not to, we clearly are not coming close to the rational objective we all aspire to in less heated environments. Chochran: Defenders think that devaluing would fool workers into a bout of “competitiveness,” as if people wouldn’t realize they were being paid in Monopoly money. If devaluing the currency made countries competitive, Zimbabwe be the richest country on Earth. Yglesias: Try this mode of argument on for size. If water made agriculture possible, then the Pacific Ocean would be the breadbasket of the earth. I found that analogy incredibly lame, and it made me think of Bulwer-Lytton contests (this year's winner: "Cheryl’s mind turned like the vanes of a wind-powered turbine, chopping her sparrow-like thoughts into bloody pieces that fell onto a growing pile of forgotten memories. "), but Keynesian Brad DeLong thought it was devastating, highlighting the importance of ideology. In contrast to this, I listened to much of the two latest Nobel prize winning economists--macroeconomists--giving their Nobel speeches...and they are as boring as any you might have remembered from college. So, it's either a rather unfocused, nasty fight about the Keynesian stimulus or experts unconsciously imitating Ben Stein in Ferris Bueller. Econ grad students going to the big annual econ and finance meetings this weekend in Chicago should ask themselves whether this is a club worth joining. Sure, the top 10 make a good living, but no one else does, as companies and municipalities don't need macroeconomists any more than they need sociologists.